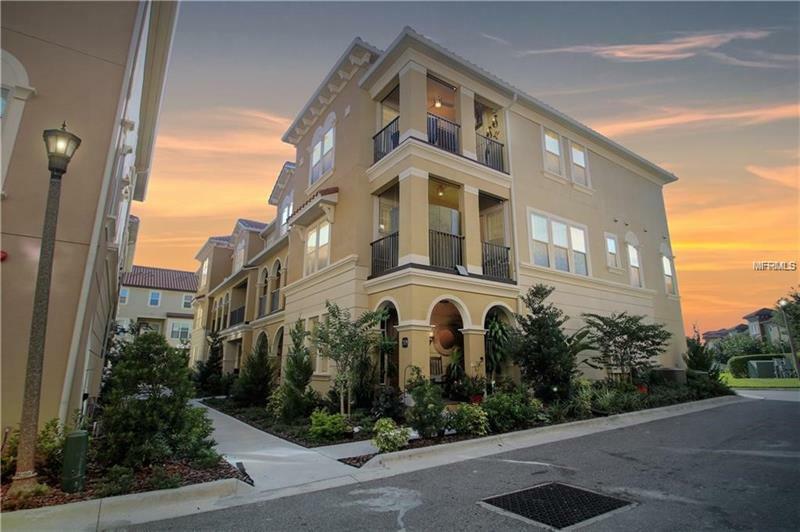 Almost NEW, This spectacular, LUXURIOUS Town Home in Upscale Lake Mary Community! Located on a CORNER lot, with a premium waterfront lot w tranquil nature scenes. Upgrades galore in this well-designed Tuscan-style home. Lots of natural light with 3 balconies/porches to enjoy the outdoors! This stunning home has added upgrades on top of upgrades! Imported custom tile in living areas, kitchen/baths, luxury carpet in the bedrooms including designer lighting, fans, etc. One bedroom and bath on first floor! The home is move in ready with designer touches through out! The gorgeous gourmet kitchen has a large island and countertops w/ granite and wood cabinets, upgraded stainless steel appliances.Large 2 car rear entry garage will bring you in on the bottom floor that features a drop zone , Downstairs on 1st floor houses the large foyer space along with a Bedroom & Full Bathroom! Upstairs enter a large living room with custom window coverings, kitchen w/upgraded granite, backsplash and island. A large dining room overlooks the screened in lanai/patio all with loads of natural light! When you enter up the stairs to the third floor , you will find 2 more bedrooms and bath , and also houses a 25x14 loft/storage (not included in htd sq ft), that could be finished. This security guard gated Tuscan community has all top of the line amenities, including a gorgeous clubhouse for parties, a large swimming pool and jacuzzi, fitness center, parks, etc. Top rated schools, restaurants, and shopping, easy transit to I-4 and 417!